By Allyson J. Weseley, Ed.D., Robert McEntarffer, Ph.D. Rob McEntarffer taught AP Psychology at Lincoln Southeast High School in Lincoln, NE for over 13 years and Introductory Psychology at Nebraska Wesleyan University for over 7 years. He earned a B.S. in teaching of psychology at the University of Nebraska, a master’s degree in educational psychology, and a Ph.D. in education. He has extensive experience in scoring the Advanced Placement Psychology free-response questions, having served as a Reader, Table Leader, and as the high school Question Leader. He is past chair of the national organization Teachers of Psychology in Secondary Schools, worked with the committee on the National Standards for the Teaching of High School Psychology, and is involved in writing assessment materials for high school and college level introductory psychology textbooks. He works as an assessment specialist for his school district. 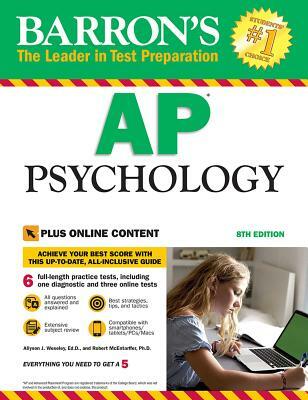 Allyson Weseley has taught AP Psychology and run a Behavioral Science Research Program at Roslyn High School in Roslyn Heights, NY for over 20 years. Her students have enjoyed great success on the AP exam, with a 100% passing rate and well over 80% earning 5’s. She earned an undergraduate degree in Psychology at Princeton University, a master’s degree from the Harvard Graduate School of Education, and a doctorate from Columbia University’s Teachers College. Dr. Weseley has served as a Reader and Table Leader for the AP Psychology exam, published a number of psychology-related activities, led several psychology teacher workshops, and served on the Board of Teachers of Psychology in the Secondary Schools.